How do you find a shipwreck in a 23,000-square-mile lake? For researchers, it can be like finding a needle in a haystack. This spring, researchers in Thunder Bay National Marine Sanctuary undertook the second phase of a research expedition to find lost shipwrecks within sanctuary waters in Lake Huron. From May 15 through 26, they used acoustics to explore deep water areas off Presque Isle. Unlike on land, where features can be documented with aerial imagery or satellites equipped with cameras, visual survey isn’t practical underwater. In some cases the water is too murky, or turbid, to take photographs. At deeper depths there simply isn’t any ambient light. A camera, therefore, would only see darkness unless an array of lights was lowered down with it to illuminate the area. Sound, however, is astonishingly efficient underwater. The density of water, both freshwater and saltwater, allows sound waves to travel great distances. When these waves encounter an object, they bounce off and in some cases reflect back in the direction of their original travel. In fact, by knowing the speed of sound through water, researchers can calculate how far away an object is. 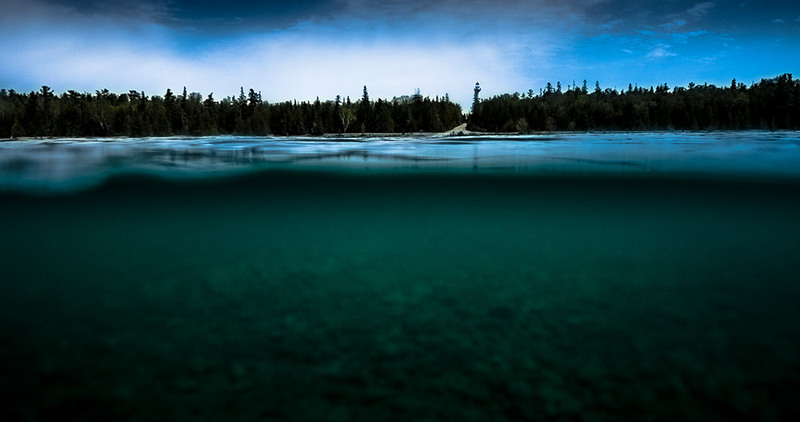 If the object being mapped is the lake floor, in this case the bottom of Lake Huron, the distance to the bottom, or water depth, can be determined by the time delay between a sound wave emitted at the surface and its travel to the lake floor and return back to the source at the surface. The behavior of sound in water is so reliable that hydrographers can make detailed maps of the seafloor, accurate to within inches. Archaeologists can also use this technology to locate undiscovered shipwrecks. Where the lake bottom is flat and even, a historical shipwreck will appear as a large “anomaly” in the sonar data, a feature that sits upright off the bottom in stark contrast to the surrounding natural features. Once located, researchers can return with additional tools, such as underwater robots or divers, to further document a potential discovery. When researchers are first characterizing the lakebed or seafloor, we use a sonar system that can see a wide strip of the bottom at once. By running a pre-planned grid of overlapping passes -- a technique referred to as “mowing the lawn” for the pattern it creates -- researchers end up with a complete map of a given area. However, this wide-scanning sonar results in a less detailed image, or lower-resolution one, than a more focused sonar would reveal. As a result, a dual-phase approach is often needed. That’s where the multiple phases of the Thunder Bay shipwreck expedition come in. 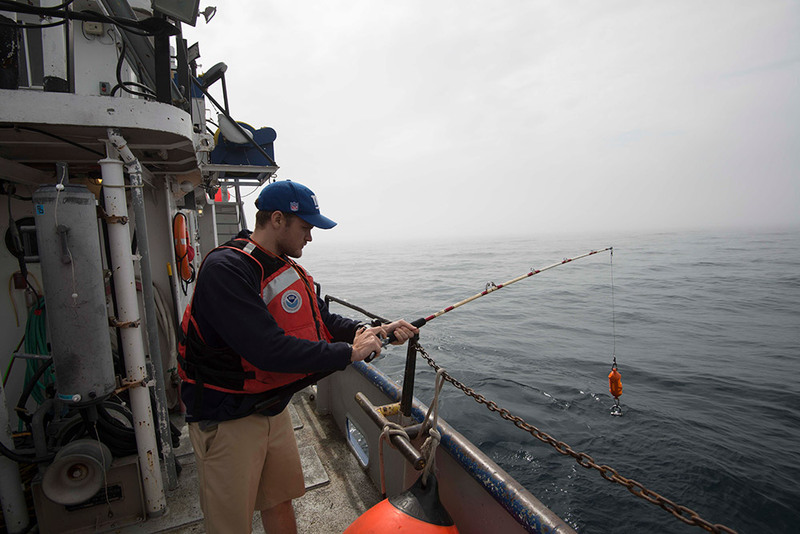 In Phase II, completed in May, researchers used a wide-reaching sonar to scan large portions of the lake floor. By surveying large areas as quickly as possible, previously unexplored areas can be covered and new discoveries made. Once surveyed, archaeologists will examine the data and tag anomalies against the surrounding lake floor. These may turn out to be lost shipwrecks. Then, in June’s Phase III, researchers will return to those targets with more detailed documentation methods. The waters off Presque Isle in central Lake Huron form a sort of crossroads for the area’s shipping lanes. The lanes for vessels traveling up and down the lakes, whether to and from the Straits of Mackinaw or the Soo Locks, all converge within about 10 miles of the Presque Isle lighthouse. Within this area, many ships have collided and sunk during periods of bad weather or limited visibility. Dozens of known shipwrecks are spread across the lake floor off Presque Isle, and many more have yet to be found. For this reason, researchers from Thunder Bay National Marine Sanctuary selected a large, 100 square mile area off Presque Isle for a wide-area exploratory survey. 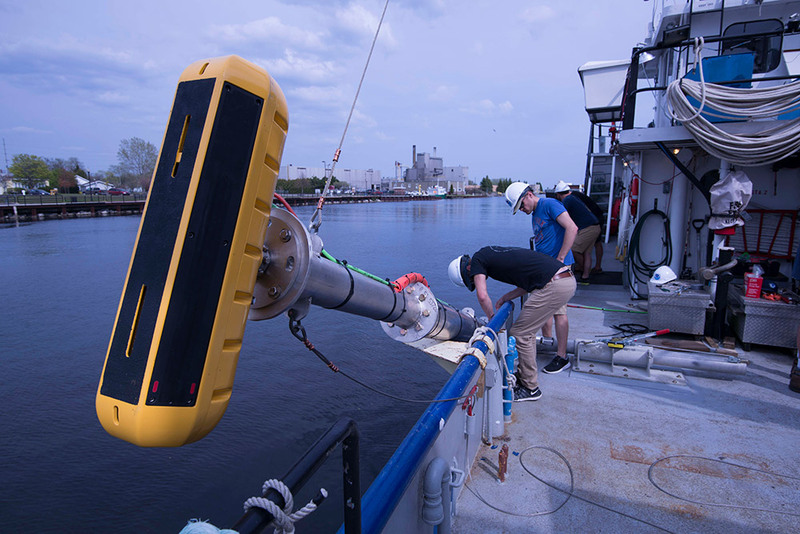 Partnering with the University of Delaware and using a research vessel from the NOAA’s Great Lakes Environmental Research Lab (GLERL), they conducted a two-week survey mission in May to search for undiscovered shipwrecks. 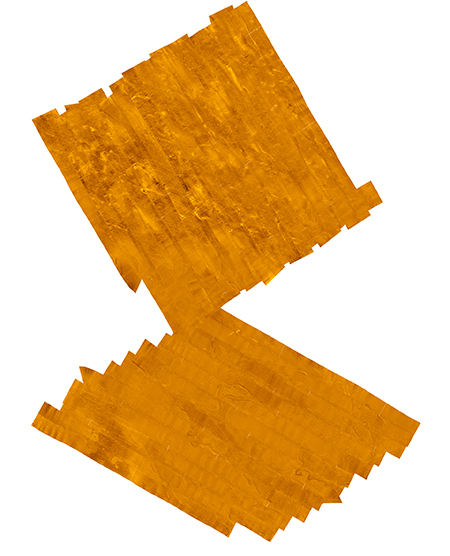 A preliminary side scan sonar mosaic composed of 24 individual survey lines. Across the lake’s bottom, numerous features can be seen, including geological formations and variable bottom types. Image: University of Delaware. With a six-person survey crew, the mission involved 24-hour continuous operations for six days. Breaking into two-person watches, members of the team would spend four hours running the survey gear, followed by eight hours off, then another four hours on within a given 24-hour time period. That way, a team of researchers was constantly operating the sonar. 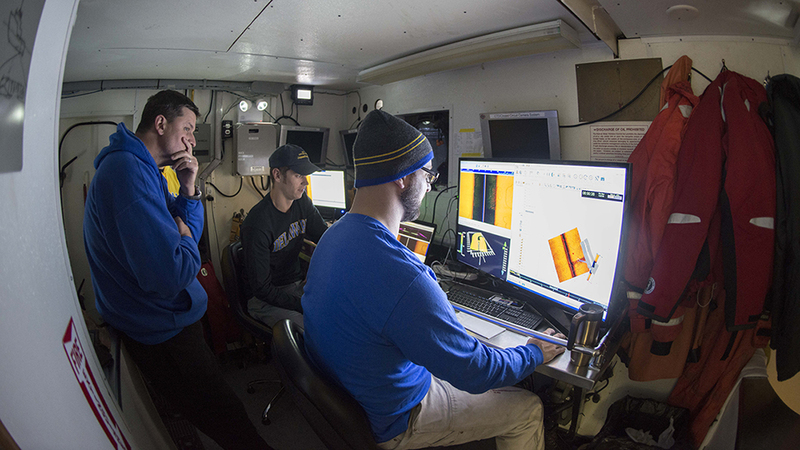 The teams logged and organized data files, selected and managed survey scan lines, and communicated with the research vessel’s crew regarding navigation, survey speed, and general movement throughout the survey area. As sonar data was logged, researchers also took additional measurements of the speed of sound through water. Approximately every four hours, a device was sent to the bottom of the lake. As it traveled, it measured the speed of sound and produced a sound velocity profile. By accurately measuring how fast sound was moving through the water, the researchers could accurately determine the distance to the bottom. As six days passed, over 400GB of sonar data was logged and 100 square miles of area were covered. Now, researchers have to process all of the data and review it for anomalous objects that may turn out to be new shipwreck discoveries. During Phase III operations, these targets will be investigated with high-resolution sonar onboard an autonomous underwater vehicle operated by Michigan Technological University. Stay tuned for a recap of that leg of the expedition in a few weeks! John C. Bright is the acting research coordinator and maritime archaeologist for Thunder Bay National Marine Sanctuary.